Easter is a perfect time to do a card making project with children. Creating a card with your kids to send to a friend or relative is a great way to sneak some literacy and creativity into their days. Quite young children might like to try writing their own message (it will look a lot like scribble, but is an important stage in pre-writing), or dictating to a parent. Older kids could think about who the card is for, and help create an appropriate message for that audience. 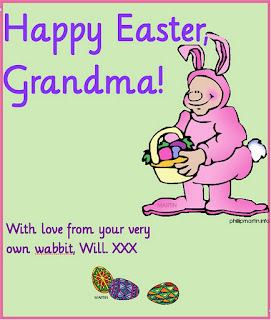 Real craft is not my forte, alas, but googling will bring you thousands of delightful Easter card projects. I liked an Easter chick from Kaboose, and Activity Village UK has some cute printables you might use in a bigger project. 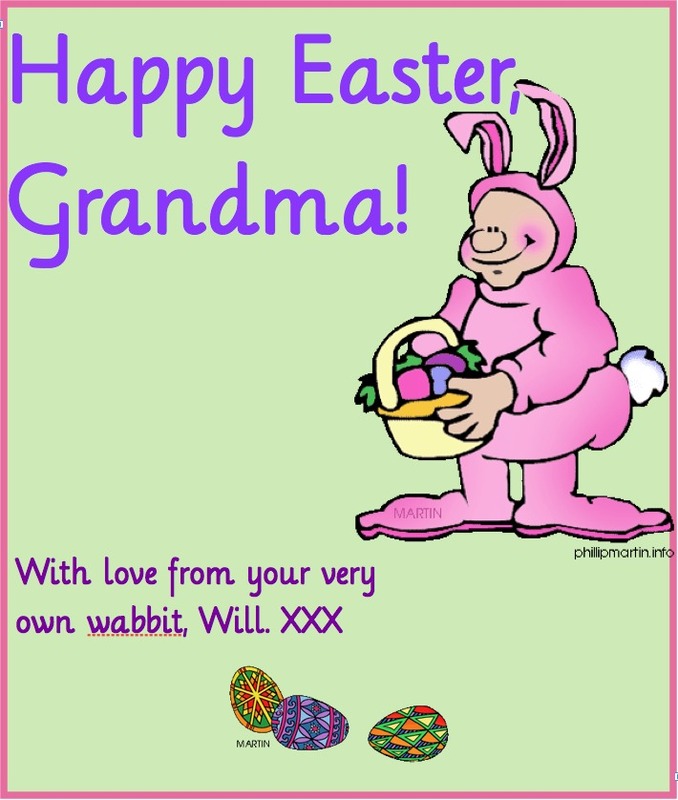 In case you don't have time for craft, I want to suggest some resources for creating a digital Easter card, something you can print perhaps, or attach in an email to someone your child loves. 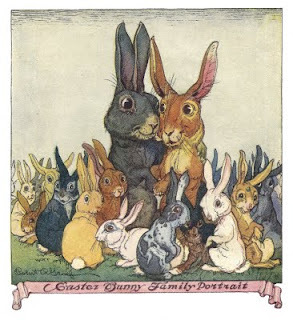 The Graphics Fairy has a search box that will bring you Easter images, eg this gorgeous Easter Bunny Family Portrait, above. Imagine buying chocolate eggs for that family! Of course, you can also use a word processing program, and add free clip art to a blank document. Phillip Martin Clip Art has some colourful illustrations that tempted me to use them in the simple picture I created at the top of this post. Or perhaps your child would like to create an Easter-themed cartoon, using one of the websites I mention in Book Chook Favourites - Cartoon Creation? The important thing, I believe, is to experience the joy of creation, and have your kids reach out to the people they love. If you do find an image your child wants to use, don't forget you can use an online editor like Picnik to add different effects, text, and stamps to it. Sadly, Picnik will close soon, but right now even their Premium service is available free to everyone.